Your friend Tessa is turning thirty! She is going to celebrate this in your favourite cocktail bar, 1806, where they make the bitter chocolate martinis just right. Clearly, the classy thing is to bake her a birthday cake in the shape of a dinosaur and bring it to the bar. 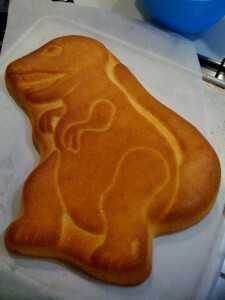 1: Search the internet for dinosaur cake pans. Bemoan the lack of selection. Find a perfect one for super cheap – so cheap that shipping more than doubles the price. Bonus! Click order. 2: Inform your and Tessa’s mutual friends that you are going to bring her a dinosaur cake. Giggle wildly at your own genius. Make them promise not to tell her. You are a master of secrecy! 3: Is cake pan here? 4: Cake pan is not here. 5: Where is goddamn cake pan? 6: CAKE PAN ARRIVES. Dance around the kitchen hugging it. 7: Tessa’s favourite cake is lemon yoghurt. 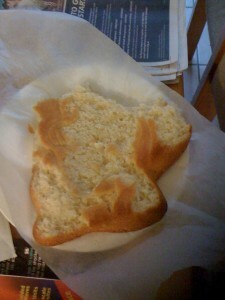 You are not sure if the recipe will be too moist to unmold properly, or if you will have to go with a pound cake instead. A test run is called for! 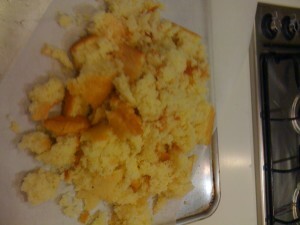 8: Make practice lemon yoghurt cake. Unmold it, holding your breath. It is perfect! Take picture for evidence. 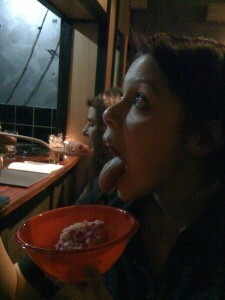 9: With the aid of your housemates, eat the legs of the dinosaur, so that he can see death approach. 10: It is three days until the birthday party. Approach the lovely staff of 1806 and check that you may bring in cake early and have it snuck down to the kitchen. Being lovely, they are pleased with this plan. 11: It is the birthday day! Get up early. Well, earlyish. Well, just after noon. 12: Go shopping for ingredients. Buy doubles, JUST IN CASE. You are confident! You are ready! You have perpetuated horrors in the kitchen before. 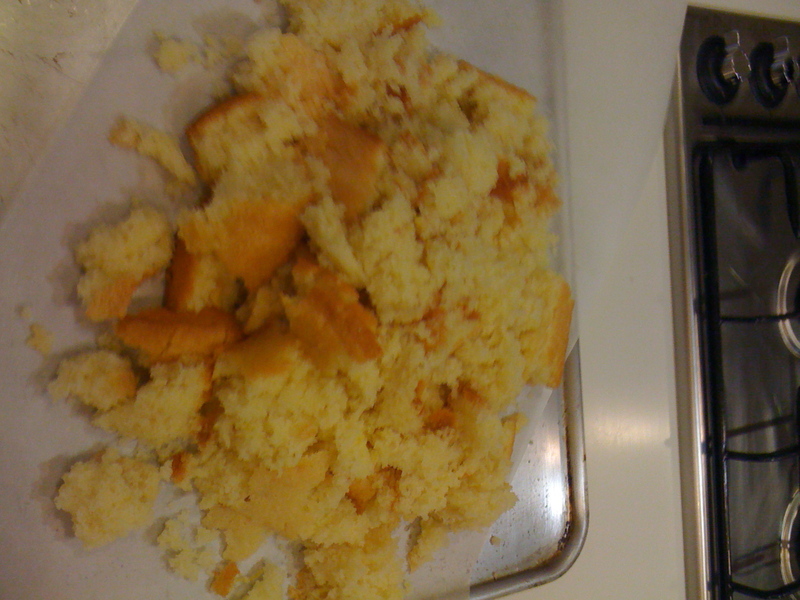 13: Return and mix up cake. Put in the oven. Mix natural yoghurt with vanilla extract for vanilla yoghurt accompaniment. You are so organised! 14: Cake is done! Unmold. 16: WELL THAT IS OKAY. THAT IS WHY YOU BOUGHT EXTRAS. SURE TIME IS A LITTLE TIGHT BUT IT’S NOT A BIG DEAL. 18: It is really not a big deal. Mix cake! Pop in oven! Wash hair because now the part where you get yourself ready for company has to fit around the stupid cake. 19: Mmmm this martini is so good. 20: Cake is done! Unmold cake. 22: THIS IS A DISASTER. YOU HAVE TWO PILES OF BROKEN DEAD DINOSAUR CAKE. WHERE IS THAT DAMN MARTINI? YOU CANNOT TURN UP AT A PARTY WITH A PILE OF BROKEN DINOSAUR CAKE BITS. 23: Wait. Wait. Yes, you can. 24: Grab your camera. At the very least, you can show Tessa that you tried. 25: Pull homemade raspberry sauce out of the freezer and defrost. Tear dead dinosaur cake into pieces. Grab vanilla yoghurt from fridge. Mix another martini. 26: Put a layer of pieces into the bottom of your housemate’s casserole dish. 27: Sprinkle strawberry liqueur on cake pieces. 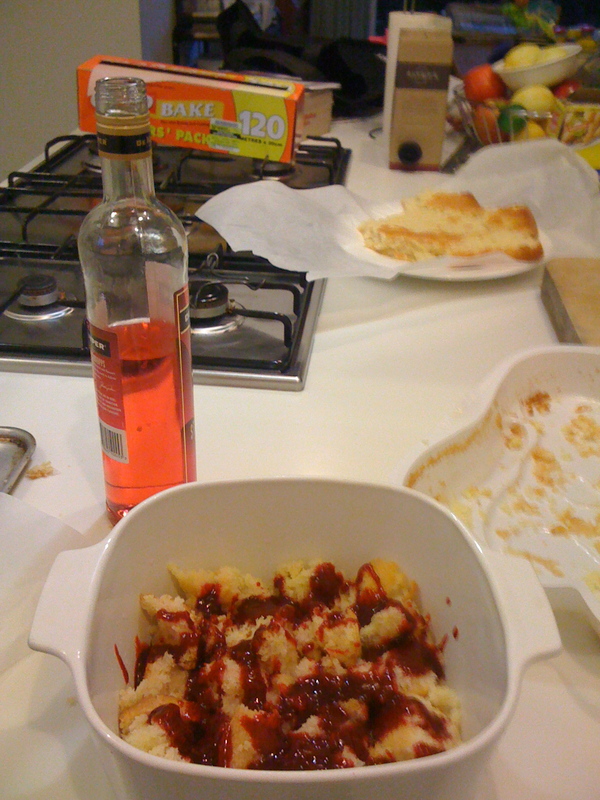 28: Pour half of raspberry sauce over. 29: Smooth on layer of vanilla yoghurt. 30: Repeat Steps 26 to 29 and throw the results in the fridge to chill further while you do your makeup. 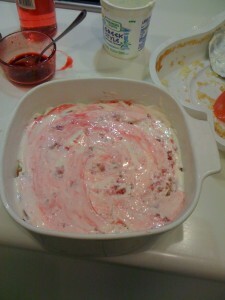 31: You have created Dead Dinosaur Trifle! Well done you! 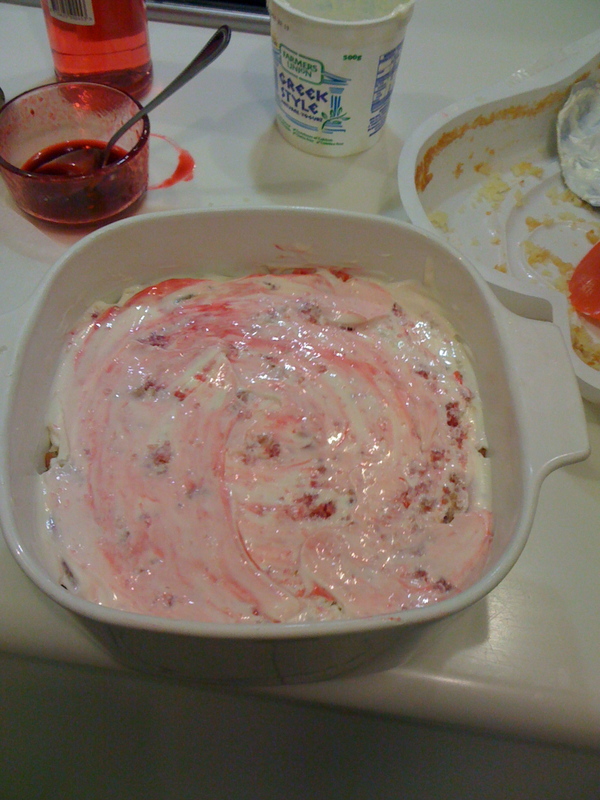 32: Deliver trifle to ravenous party attenders, who declare it amazingly delicious. 33: You are the queen of the kitchen! You are the empress of improvisation! You are the goddess of disaster. 34: Oh, go on, have another martini. Optional, by which I mean REALLY NOT NECESSARY: Have a friend keep reminding you about that episode of Friends where Rachel made the trifle. Oooh, new spooky theme I hadn’t seen yet! I was wondering whether it was possible to request the first picture without questioning your original success. But then I see it on your otherÂ blog so I thought you’d want to know it was missing here.